This item is not available for purchase online. Please call 434-385-0185 for more information. 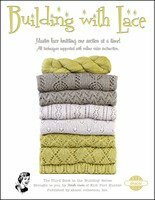 Building with Lace is the third book from renowned knitter and teacher, Michelle Hunter. Featuring HiKoo® Rylie for a perfect pairing of yarn and pattern, it is a carefully designed sequence of patterns that introduce knitters to lace work starting with the basics and working towards more difficult patterns. This work follows the same format as Michelle’s earlier books, Building Blocks and Building in Color, and has been a long awaited addition to this educational series.